It’s been a while since digital DJing has seen a bona fide major hit. Traktor continues to dominate the scene. But Traktor is still software molded for the professional DJ, and particularly those in the club scene. When Traktor came to the iPad, it saw a significantly-streamlined interface, but the underlying functionality remains geared for the professional user – so much so, in fact, that it’s possible to exchange libraries and hardware interfaces between the two. That’s a good thing for Traktor’s intended audience, but it leaves open a window in the market. Even arguably more consumer-friendly software like Algoriddim’s market-leading djay still resemble DJ apps of old. Pacemaker might not be who you’d bet on as the new major player. Founder Jonas Norberg has so far hit two strikes – an app for Blackberry Playbook (oops) and a pricey hardware gadget that failed to compete with laptop DJ solutions. But Pacemaker for iOS has an ace in the hole: Spotify. And that could change DJ consumption. It might also be disastrous news for producers who at least could rely on selling music to DJs. But more on that in a moment. Pacemaker is easily the friendliest-looking user interface in DJing yet. It strips away the user interface elements that might frighten and confuse new users. The opening screen is almost blindingly spartan, featuring blank gray decks and triggers to add music. Pacemaker won’t scare away any new users. When you do tap to load music into your deck, you’re presented both with your iTunes Library and an option to log into Spotify. Sign into a Spotify Premium account (or sign up for a free trial), and your playlists appear in the library. You can also add any track from the entire Spotify library. Pacemaker should soon find its way onto everyone’s iPad for this feature alone: you can load up Spotify tracks as easily as iTunes. That includes both your own playlists and collection and anything else your Premium account can stream. This is, of course, the moment at which producers shudder. Pacemaker requires an active Internet connection, but assuming your venue has that, the previous major justification for buying tracks to use them in DJ sets may have just disappeared. That threatens the business model of the likes of Beatport on one end of the spectrum and countless independent labels and producers on the other. Even as the rest of the market has shifted to streaming, at least the DJ could be counted on to buy up lots of tracks before heading to the gig. But wait a second – apart from requiring an Internet connection for streams, this also depends on how good a DJ app Pacemaker is. And there, the results are … mixed. Ahem. 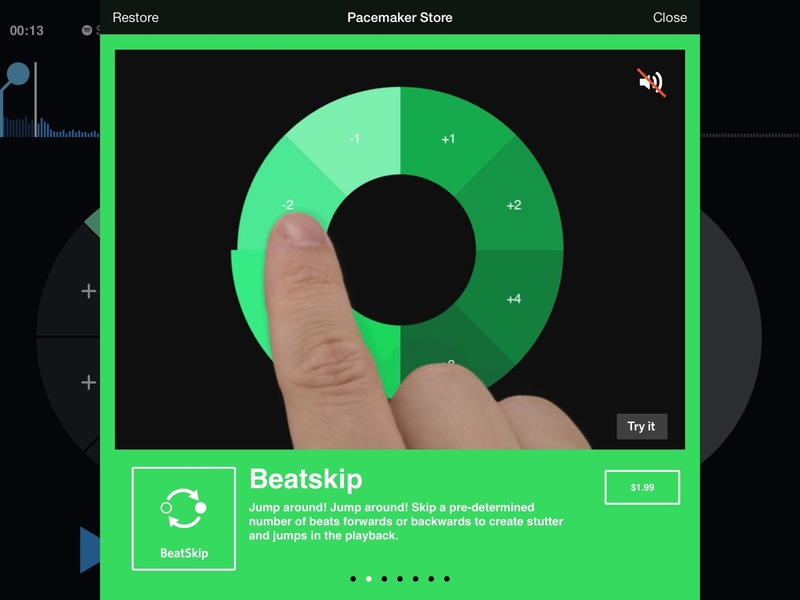 Spotify in Pacemaker is probably not going to kill Beatport. Pacemaker’s UI is nothing if not clean and attractive, a refreshing change from the industry norm. It’s also consistent with the brightly-colored, high-contrast, geometric look Pacemaker introduced years ago, long before these sorts of aesthetics became associated with iOS 7. 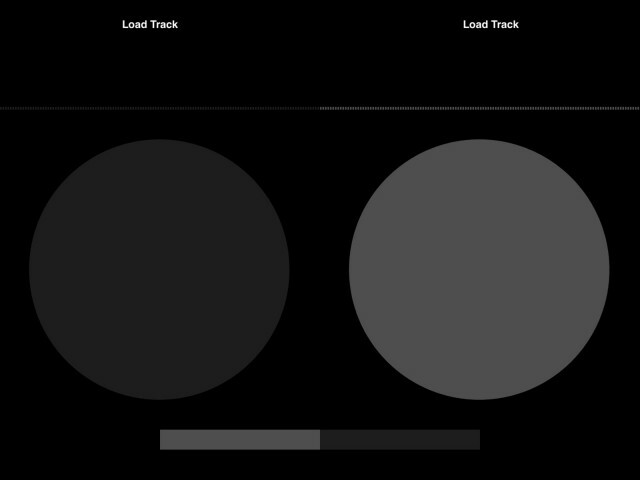 If all you want to do is mix two Spotify tracks together, Pacemaker will happily oblige. Amplitudes display in simplified vertical bars at the top, with indicators for position, as a touchable circular deck spins away at the bottom. The interface is partially skeuomorphic. The decks spin like records, including simplified turntable-style acceleration and decceleration and scratching behaviors, but without overly-slavish cosmetic icing. Those decks are essentially digital hybrids, however. Tap one of the four icons in the center of the “record,” and you find modules for looping, pitch-independent tempo adjustment, effects, and triggers that jump around cue points in the song. There’s also a big, friendly “SYNC” button, which works as advertised. The problem is, in comparison to Traktor’s clever synchronization, sync isn’t happening in the background. And Spotify’s library doesn’t present BPM information (at least not that I could find). So you’re left with a certain amount of guesswork and waiting. 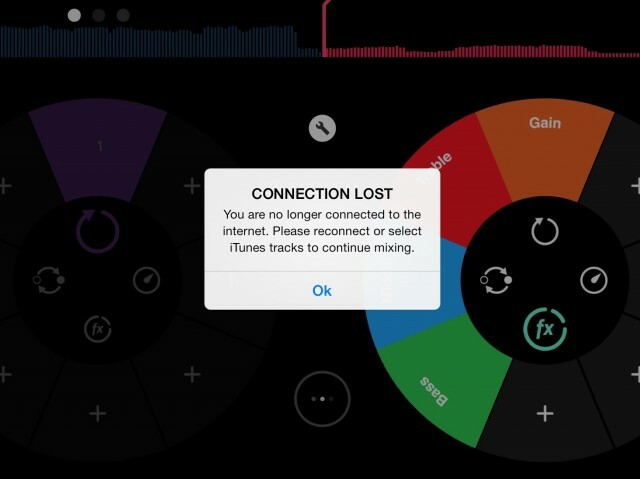 Ironically, that means something like Traktor is friendlier to new DJs who don’t beatmatch. Tapping the icons in the center of the decks pulls up cleverly-designed, elegant interfaces for cues, beats, and effects. A bundle covers all of the essentials. 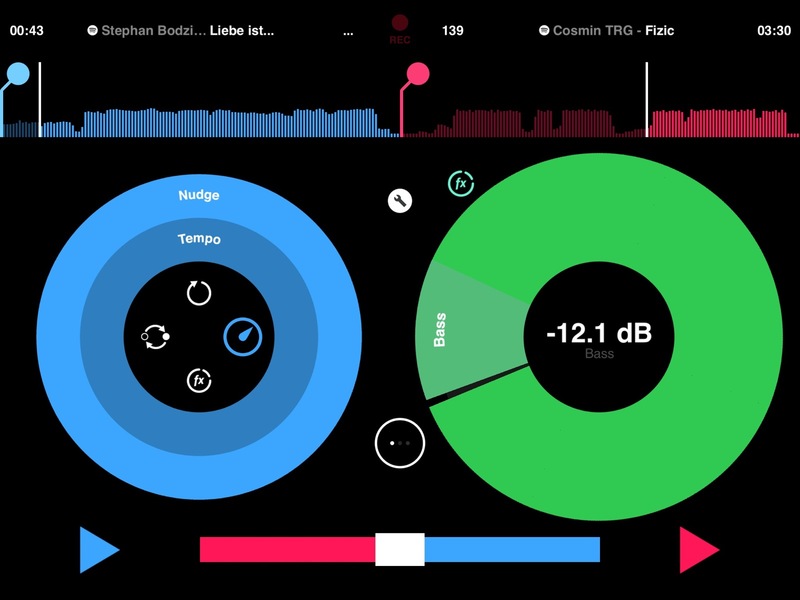 And the price is right – though competing apps Traktor for iPad and djay offer better sound quality and loads more options. Access to Spotify is simply extraordinary. And here, I certainly have to utter a dirty word: “requests.” Sure, DJs generally hate them. But remember that “DJ” doesn’t just mean someone playing a club. For many, many iPad owners, wedding gigs and the like are bread and butter. And if it’s someone’s wedding, you don’t yell at them when they request a song. Spotify integration makes this quicker and more affordable. But as far as the app itself, it’s tough to recommend Pacemaker over either djay or Traktor – yet. Some modules also work better than others. Looping and cue points are dramatically simplified, and executed in an elegant, obvious way that should appeal to the casual audience for which the app was intended. But again, even a fairly casual user can benefit from having additional visual feedback that keep them oriented. Beatskip’s “+8” is hard to follow because you can’t see what you’re doing. And no matter how casual the user, sound matters. It’s nice to be Native Instruments and have genius, industry-leading DSP scientists in your office. The faux turntable effects on Pacemaker are simply awful: the pitch changes, but in an obviously-digital, distorted way. And that means you’re not rewarded sonically for touching the app. The filter sounds muddy. The reverb sounds glitchy and cave-like. For wedding DJs, none of this should matter, and that’s a huge market that may find even djay too complicated. (You don’t want to add these sorts of effects or scratching at a wedding, obviously. And mixing works just fine.) 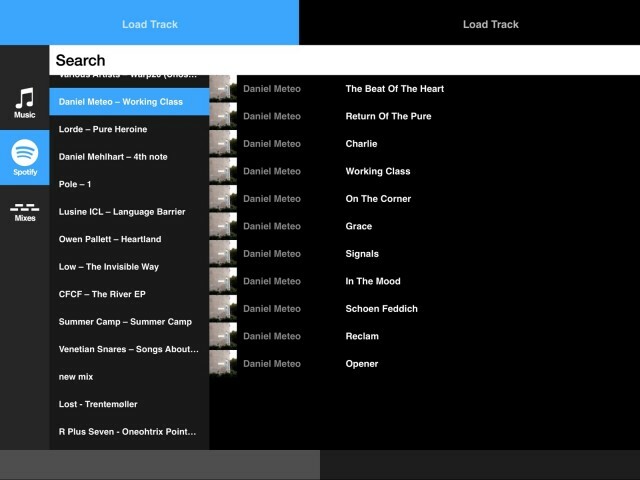 Additional library navigation would make that even more powerful, and wedding DJs might still want offline access to their Spotify tracks – if Spotify would be willing to agree to such a thing. But the two-deck affair might not work as well as more advanced queuing in wedding situations. Don’t get me wrong: Pacemaker has done a brilliant job of UI design. The interfaces are rewarding and clear. 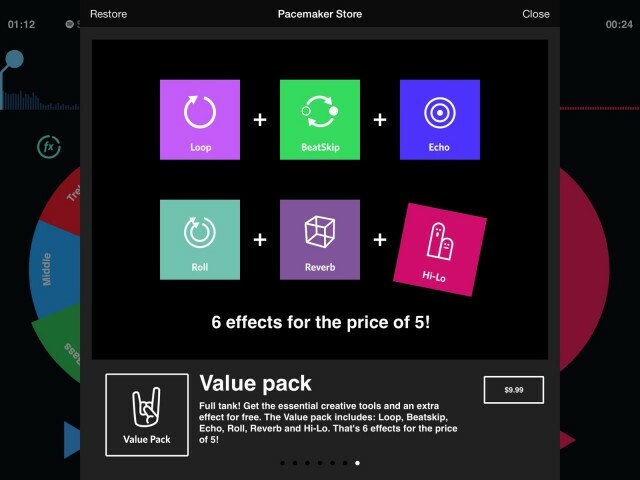 In-app purchasing is done nicely: there’s a ‘Try It’ mode so you can use a live demo before you buy. And pricing is reasonable. I just have a sinking suspicion that Pacemaker’s over-simplification actually makes it harder to use. I’ll have to test it out on some non-DJs who have never seen it before and see what they prefer. 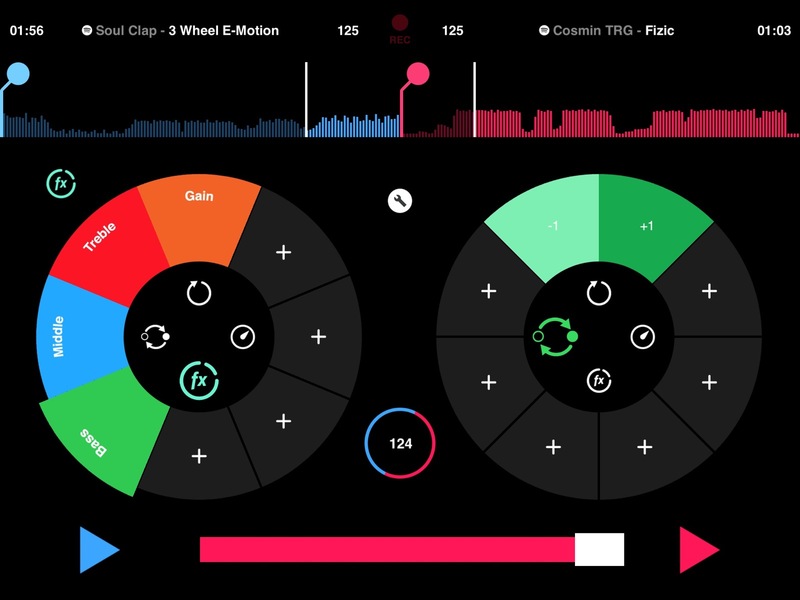 But I think djay has risen to the #1 app because they strike a good balance between pro and consumer, and even Traktor is accessible enough to non-DJs by providing its feature set in a clear way. I wouldn’t hesitate to recommend either of these even to someone who just wants to DJ a friend’s party. As a starting point, Pacemaker has a great, eminently-sensible first release. If they want to win over users, they’ll want to improve visual feedback and the sound experience, as these are likely to make the app far stickier. In the meantime, my guess is, Spotify is the real winner here. Now the question may be, will another app sign up for a Spotify licensing deal? Just hope that Native Instruments, Serato, and company never do, if dance music download sales have a future.